Enjoy 12 decadent truffles of your own selection, in a beautiful matte- black box. 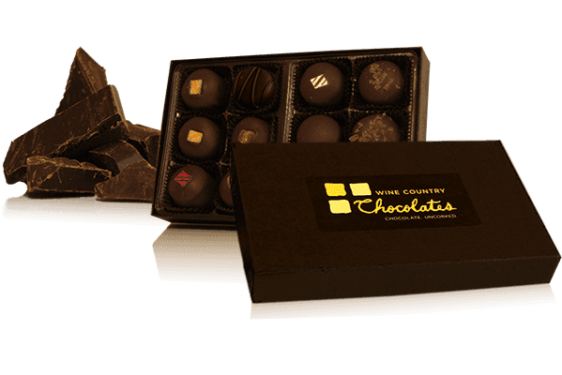 Pick among our selection of wine truffles, fruit purees, coffee, liqueurs, etc. 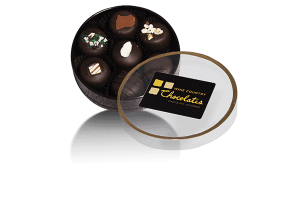 Any seven truffles you wish or click on “An assortment of our favorites” and we’ll make a wonderful assortment for you. No preservatives or waxes, a fresh product made by us daily. To customize your twelve piece truffle box, select how many of these truffles you’d like by clicking off this window. 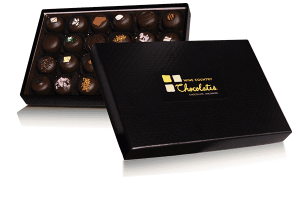 Once you have picked the 12 truffles you would like in your Truffle box the add to cart button will appear at the bottom. A dark chocolate truffle infused with sweet Italian Amaretto almond liquours. Topped with a delicate almond sliver. It’s an almond lover’s escape to paradise. The Add to cart button will appear once the total of 12 truffles have been selected.